If you were going to celebrate Trek's 50th anniversary in style, Creation Entertainment's massive five-day Las Vegas con was the place to be! This week hosts Cam Smith and Tyler Orton, along with returning special guests Scott Hardy and James Chesser, stave off crippling exhaustion by recounting the mega-event's most exciting guests and highlights, as well as their own personal lows and triumphant vendor room purchases. In addition, the foursome delve into the backstage drama and pyrotechnics behind Subspace Transmissions' live stage debut discussing the influence of cinema on the franchise. Wanna appear on the show? 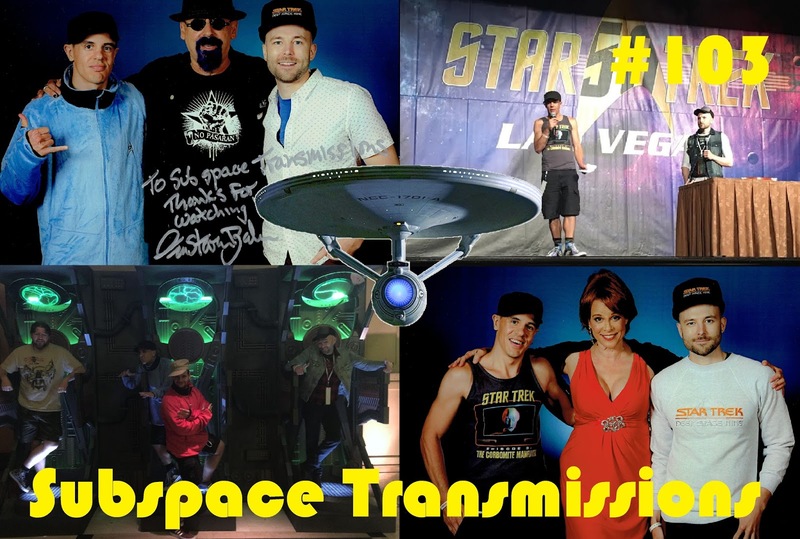 Shoot us a 30 to 60-second audio clip letting us what your FAVORITE LAS VEGAS STAR TREK CON 2016 MEMORIES are and you could take the spotlight in an upcoming program! You can also send any other questions, topic ideas or feedback to subspacetransmissionspod@gmail.com! *Live Subspace panel photo by Stefan Estonilo. Join us next week as we discuss film's influence on Star Trek!